The San Bernardino attack doesn’t fit our narrative scripts. There is a disoriented hush on the morning after the massacre. 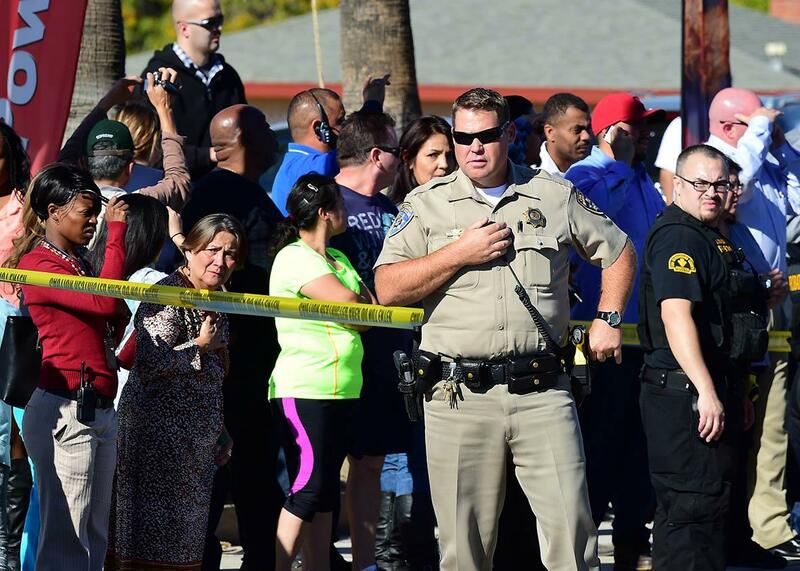 A crowd gathers behind the police line near the scene of a shooting on Dec. 2, 2015 in San Bernardino, California. So far the news hasn’t quite known what to make of it. After the first reports of the massacre at the Inland Regional Center in San Bernardino, California, Wednesday afternoon, everyone fell into familiar scripts: Despair from those who oppose guns, defensiveness from those who believe they make us safer, micro-debates about whether it was “too soon” to politicize the tragedy, and a new sidebar about whether “thoughts and prayers” were an insult, a cop out, or anti-religious hate speech. But even the foreign-terror script was then scrambled by reports that Farook may have been a disgruntled employee who left the holiday party for the San Bernardino County Department of Public Health, where he had worked as an inspector, after arguing with another attendee, then returned a short time later with an arsenal and an accomplice. Authorities haven’t ruled out workplace violence as a factor. And unlike so many recent shooters, the incredibly rare husband-and-wife team seems to have left no online clues as to their motives. And so America started out the morning oddly quiet, but with even continued calls for gun control (at least two of their guns seem to have been purchased legally) slightly muted today as we wait to learn what really happened in San Bernardino. If it turns out to be foreign terrorism, the gun control script will be scrambled as well. It leaves the GOP candidates not completely sure what to tweet, although some news outlets are willing to jump in with the old Jihadi terrorist script, and hope it’s borne out by subsequent facts. We are not all that good at waiting to learn what really happened, and yet in this case, it really is too soon to jump to conclusions. We love our familiar scripts. But we don’t yet seem to have the facts that allow us to pick one. Especially when we are vulnerable, we like to conform the smattering of facts to our feelings. But it’s been less than 24 hours since the most deadly shooting to happen in this country since Sandy Hook, and we need to wait for some answers. If we aren’t looking at any of our familiar terror scripts, it’s possible that the hybrid version will be even more frightening.